David Lee, PF 36 MIN | 6-10 FG | 6-6 FT | 8 REB | 4 AST | 0 STL | 0 BLK | 2 TO | 18 PTS | +8A solid game from Lee on the offensive end. Instead of force feeding Lee multiple times in the post, the Warriors offense — much in part to their pitiful play through the first three quarters — called for a lot more outside shots than usual. If the game had been close or the Warriors had the lead would things have been different? Possibly. But Lee adjusted accordingly and managed to grab the most rebounds — along with JO — Tuesday night. Defensively, Lee often was targeted by the Raptors both on the perimeter and inside. Steve Novak was found open three times beyond the arc in the 2Q, in large part because of Novak coming off screens or simply finding space. Still, given Lee’s struggles this season this was a step in the right direction. Harrison Barnes, SF 31 MIN | 7-12 FG | 3-6 FT | 3 REB | 2 AST | 2 STL | 0 BLK | 1 TO | 19 PTS | -8Barnes had a tough cover tonight against the lengthier Rudy Gay. While Gay’s efficiency is often laughed at, his physical gifts are ever present and always need to be taken into account. Gay’s length bothered Barnes all game with exception of the 2Q when Barnes made all five of his shots on his way towards a 14 points for the quarter. Barnes was held in check in the second half and only played 11+ minutes as Mark Jackson favored the defensive-minded Draymond Green for the rest of the game. Barnes has played well since his insertion into the starting lineup for Iguodala, and the Warriors would love for his aggressive play to continue once Iguodala comes back. The Warriors are 19th in the NBA in bench scoring (30.9 PPG). Andrew Bogut, C 25 MIN | 5-7 FG | 0-0 FT | 5 REB | 1 AST | 0 STL | 0 BLK | 2 TO | 10 PTS | -17Bogut didn’t have the greatest of starts as Jonas Valanciunas was hot early and impressed with a fluid spin-to-slam move in the 1Q. But, Valanciunas got into foul trouble early and only played 26+ minutes for the entire game. 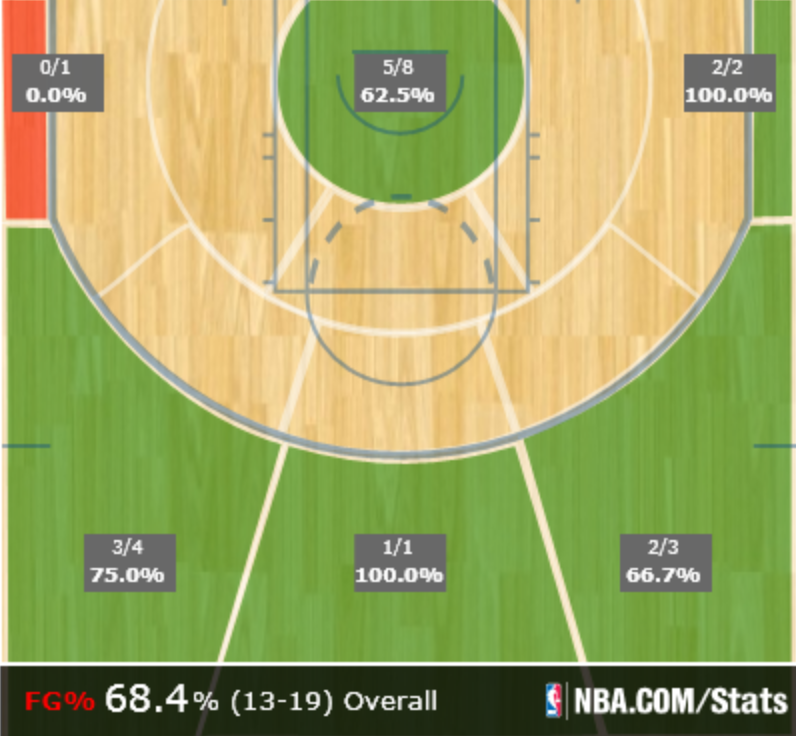 Bogut did well with his shot “selection” tonight as he was able to do his usual dirty work inside. The Warriors actually began their run with Bogut on the bench, and as Jackson stated postgame he just had to stick with the unit that was making plays and one that would give them the best chance to win. Most of the time that lineup will include Bogut, but in such a weird, confusing game it only made sense. Bogut got additional rest as he gets ready to face the toughest test in the NBA at his position on Friday: Dwight Howard. Stephen Curry, PG 43 MIN | 8-15 FG | 8-10 FT | 3 REB | 10 AST | 5 STL | 1 BLK | 3 TO | 27 PTS | +16Let’s just fast forward to the second half, where Curry scored 23 of his 27 points and dominated in ways only he could dominate. 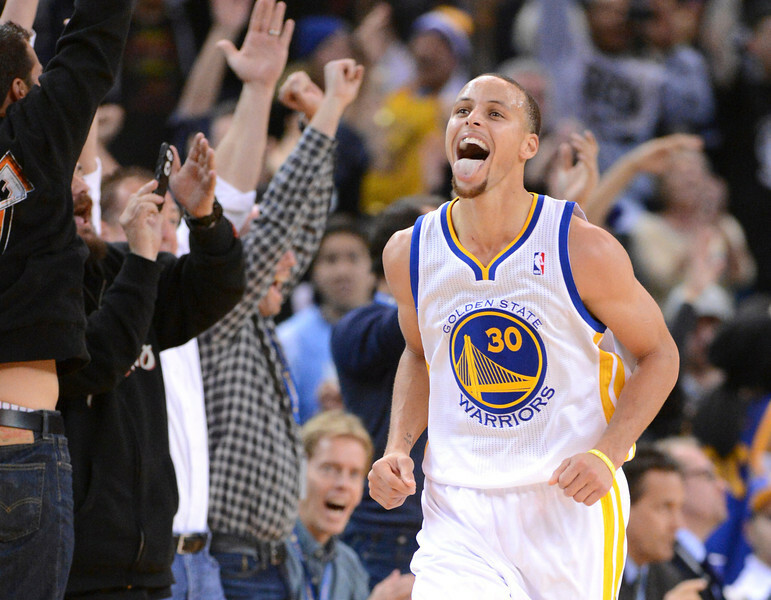 Since coming back form his concussion Curry is averaging 27 PPG, 8.8 APG in 41.5 MPG. Tonight — similar his game against Sacramento — Curry made and and all semblances of a shot and consistently displayed his improved passing skills. Curry is always good for a few one-handed turnovers a game, but the team will accept those if he continues to be Top-5 — he’s currently third (8.8 APG) — in the league in assists. What also helps a shooter? Free throws. Curry went to the line 10 times on Tuesday night, which is the second most he’s ever attempted in his career (12). While his first half was forgettable, great players find ways to adjust, and Curry did just that willing his way towards a win. Another special game from the franchise centerpiece. Klay Thompson, SG 41 MIN | 8-20 FG | 0-0 FT | 3 REB | 7 AST | 1 STL | 0 BLK | 2 TO | 22 PTS | +5Like the rest of his team, Thompson was off to a very rough start. Missing shots and DeMar Derozan having his way with him were the lowlights, but like his fellow Splash Brother, Thompson was able to find his way towards a productive game. We’ve seen these types of runs before, runs that only Oracle can create. Whether it starts with a turnover on the other end, a fast break, a pull-up three or even a mid-range jumper, runs like the Warriors put on in the 4Q are ones to remember. The crowd got into it and the shots started splashing as Thompson was 4/5 with 12 points and a (+/-) of 27. 27! The Splash Brothers were incredible in the final stanza as the Warriors outscored the Raptors 42-15 in that final quarter and completed the largest recorded comeback in franchise history. Looking ahead: The Warriors now embark on a three-game road trip that starts on Friday in Houston and continues on Saturday in Memphis (last win in Memphis: 4/4/08) and Monday in Charlotte. Wow, Raptors playing amazing. Can’t wait for the 4th quarter debacle. What a game! O’Neal was at +30 he was the reason (from his halftime pep talk, to his play and leadership on the court) that the Warriors won the game! Green and Curry, +26 and +16, respectively, were also instrumental. Incredible comeback!